Late Tuesday, Sept. 24, a forecast that had predicted sunshine for the upcoming weekend changed dramatically. Instead of mild fall weather, a series of unusually wet and windy storms were brewing in the North Pacific Ocean, forecasters warned. The storms were gathering up tropical moisture from the remnants of Typhoon Pabuk. Sure enough, the storms shattered rainfall records across Northwest Oregon and Southwest Washington. Nearly a foot of rain fell in the North Coast Range, and at least a half-foot in many other locations on the coast and inland. But despite the usual trouble with downed trees, flooded basements and ponding water on highways, there was one thing that remarkably didn’t happen: U.S. 101 south of Seaside remained open. 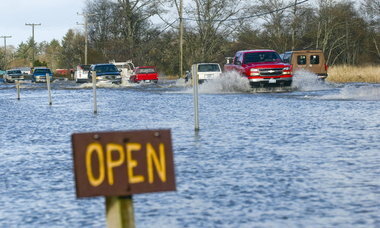 Instead of feet of water pouring over the roadway from Necanicum River and Beerman Creek, there was just a few inches. Officials with the Oregon Department of Transportation credit the lack of flooding to a flood mitigation plan and habitat restoration project spearheaded by the North Coast Land Conservancy and funded by ODOT. Ten years ago, the nonprofit land trust bought 364 acres – including previously cleared land and the floodplain along the river – with an eye toward protecting rare Sitka spruce wetlands, salmon and wildlife habitat. It was clear that a 1.5 mile levee built by developers in the 1960s was the cause of the yearly flooding on the highway for the past 40 years. People had to endure long detours to get to work or to a hospital; emergency services were delayed. Katie Voelke, the land conservancy’s executive director, said despite the best efforts of local community leaders for nearly five years, plans to remove the levee never really got off the ground. The cost was an estimated $1 million. Then one day out of the blue someone at ODOT called Voelke. Because ODOT's road projects often affect waterways and wetlands, the agency is required by law to enhance wetlands in other areas as mitigation. 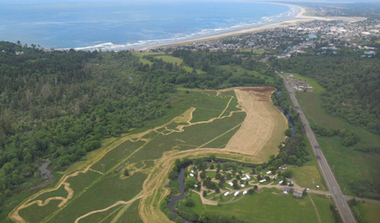 Was the North Coast Land Conservancy looking to do a wetland project that ODOT could fund? It was. And earlier this year the levee was removed. This spring and summer conservancy staff and volunteers added more than 100 woody debris complexes inside the floodplain. Comprised of logs jammed into the ground as anchors with additional trees and their rootwads tethered to the logs, the complexes provide fish habitat when the plain is flooded, as well as perches for raptors and nesting habitat for birds. They also create eddies and calm water to keep young fish from being flushed out to sea, Voelke said. The system got its first test 10 days ago when the rains came early and in earnest. Voelke said the Necanicum River crested on Sept. 28 and the water began flowing into the floodplain for the next three days; 120 acres were inundated, but U.S. 101 wasn't. The flood plain also came alive with hundreds of birds. “We were pretty excited,’’ Voelke said. Lou Torres, an ODOT spokesman, said a lot of people in the agency believed the project would work, but this was only the system’s first test. Torres said even if the system reduces flooding by 50 percent, that’s a lot better than highway closures and flooding every time a storm blows through.